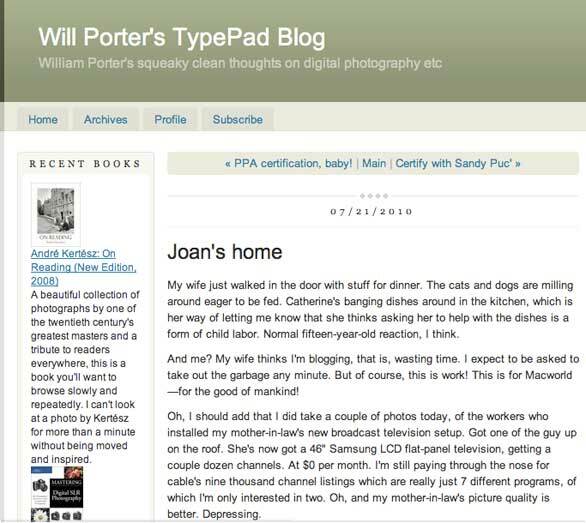 TypePad is a full-featured online blogging service run by the folks at Six Apart. Six Apart became famous almost a decade ago for creating Movable Type, one of the first major blogging applications, and one that is still widely used. Movable Type is installed on your own Web server, giving you total control of every aspect of your blogging system. The TypePad application on the other hand runs entirely in your Web browser, and TypePad also hosts your blog for you online. TypePad competes with other paid and free online blogging services such as WordPress ( ), Blogger, and LiveJournal. TypePad offers a free blogging service called TypePad Micro, which might be fine for personal use by people who aren’t planning to do much blogging, who don’t care about customizing the look of their blogs, and who want to have their micro blog hosted by TypePad. If you want the simplicity of Facebook without the hassle of social networking, TypePad Micro might suit you. But keep in mind that there are other free services with more features and more flexibility than TypePad Micro, including Blogger and Tumblr. That probably explains why most TypePad users pay for a pro account. There are three levels of pro account: They cost $9, $15, and $30 a month respectively. Every pro account comes with personal support and some level of control over the look of your site. And with any pro account, if you like, you can use your own domain name as the Web address for your blog. The higher priced accounts simply let you create more blogs, give you more storage, and offer greater degrees of control over blog design. Unless you know in advance that you want to host 10 different blogs with multiple authors, the $9 a month “pro plus” plan will probably give you more than enough to get started. You can upgrade later at any time, if you need to. Blogging is one of the most common activities on the Internet these days and aspiring bloggers have lots of options. TypePad might appeal to almost anybody, but I think it has the most to offer to users who plan to take blogging pretty seriously, as a venue for personal publishing, as a means to promote businesses, even as a way to make money. Like its sibling Movable Type, and competitor WordPress, TypePad's feature set is wide and deep. TypePad gives subscribers an excellent editor, stellar tools for managing assets like photo and video collections, built-in search-engine optimization and syndication (RSS), and an easy path to turning a blog into a cash cow—or at least a quick-change guinea pig. One of TypePad’s distinctions is its Library, which includes support for custom lists called TypeLists. Here, I’ve placed a list of books I’ve read recently on the left side of my blog. As for the blog itself, I’ve picked a classic design here, but TypePad provides a very wide range of customizable, attractive templates. On top of all that, TypePad plays well on the Web with other popular services such as Twitter and Facebook, so your blog posts can automatically get tweeted or touted to your adoring fans. Want to blog on the go? TypePad has an app for most major smart phone operating systems, include the iPhone ( ), Android, Palm Pre, and Blackberry. Even without a smart phone, you can blog by sending a simple email. If you are familiar with John Gruber’s brilliant and simple formatting system, Markdown, you can even format your blog posts beautifully in any plain text editor. TypePad pro accounts can be customized. You can control what types of content appear alongside your blog posts, for example, you can show a calendar, a list of recent posts, or your favorite links. You can select from a wide variety of attractive design templates, and in many cases customize those templates fairly easily. If you have one of the higher-priced accounts, and you can cope with CSS (Cascading Style Sheets, a key Web design technology), you can make your blog look pretty much any way you want. My personal favorite TypePad design feature is its support for TypeKit, a brilliant technology that lets you go way beyond the fonts you expect your users to have installed on their computers. TypePad includes a special Library feature. In your library, you can store and manage files, photo albums, and TypeLists. The ability to create photo albums right in TypePad makes it a particularly attractive service for avid photographers. TypeLists are simply lists of links, books, albums, or notes that you want to share on your blog. I decided to create a running list of books I’ve been reading lately and display it in a column alongside my blog. I’m a little disappointed that TypeLists don’t support other things, like movies, places, or people. But if you are a list-making sort of person, you might like this unusual feature. Although I am an old hand at blogging and have used a number of other services, when I started to set up a new account at TypePad, I found myself repeatedly challenged by TypePad’s somewhat busy user interface. After a couple trips to the online help and a little patience, I managed to sort everything out on my own. One challenge that seems worth noting specifically is the difficulty of importing legacy posts from Google's free and very popular Blogger service. While some other services (including WordPress) can import your old blog from Blogger quite easily, TypePad requires that you edit your Blogger template extensively before exporting from Blogger. TypePad does provide step-by-step instructions for this process. And when you are done, if you followed the instruction about saving your old Blogger template, you'll be able to put things back as they were before—if you care to. Still, given Blogger's large user base, I suggest that TypePad consider doing what it can do to make this process easier. TypePad is a premium blogging service that is very well suited to the needs of serious—and tech-savvy—bloggers. Like Movable Type and WordPress, TypePad seems to be aimed at grown-ups with jobs. On the other hand, although I’ve seen dozens of very cool and very creative blogs hosted by TypePad, I suspect that, if I were 20 years old and blogging for my Irish folk band—or if I simply wanted to wet my toes in the blogging ocean—I’d pick something like Tumblr or Facebook, which are simpler and less expensive. Extensive feature set provides nearly complete customizability. Excellent rich-text editor for those who like to write. Library feature lets you store files, photo albums, and TypeLists on your blog. Free option is very limited. The most usable pro accounts are pricey compared to the competition. Variety of options sometimes make for a busy, confusing user interface. Importing legacy blogs from some other services like Blogger may be a hassle.